Whisk first 8 ingredients in medium bowl to blend; season to taste with ground white pepper. Transfer 3 tablespoons marinade to small bowl and reserve. Add tuna to remaining marinade in medium bowl and toss to coat. Refrigerate at least 30 minutes and up to 45 minutes. Spray grill rack with nonstick spray. Prepare barbecue (medium-high heat). Alternate tuna cubes, bell pepper squares, and onion squares on each of 6 metal skewers. Grill to desired doneness, turning frequently, about 4 minutes total for medium-rare. 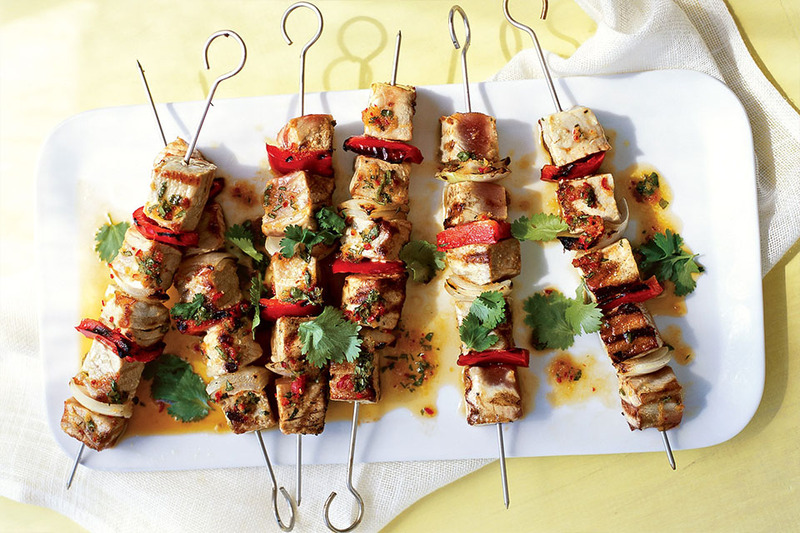 Transfer to platter and drizzle reserved marinade over; sprinkle with chopped cilantro.